trench coat: wardrobe staple or not? There are some things that we're told every woman has to have in their wardrobe. I've already decided I'm not the white-button-down-wearing type (usually on that list) and therefore don't need one, but what about a trench coat? I love the look of it, and it's perfect for transitional weather like we're having now. I was all about the trench while I was pregnant (here and here) but in reality, I hardly ever wear it. What do you think? Keep it or let it go? Subscribe to the mindful closet email list - no more than one email a month! There are always different capsule wardrobe challenges going around the internet. In recent memory, there were 30x30 (30 pieces for 30 days), then Project 333 (33 pieces for 3 months), then the Unfancy capsule (37 pieces for 3 months). Currently, 10x10 (10 items for 10 days) is popular. 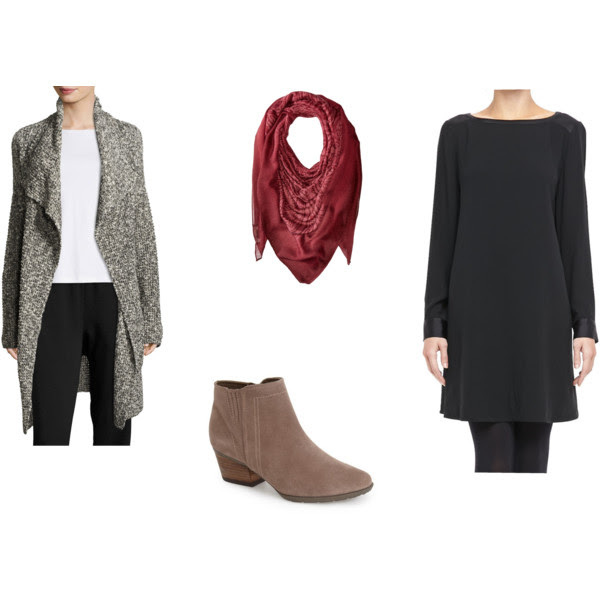 Since I wanted to introduce you all to how versatile, practical, and useful Eileen Fisher clothing is, I thought I’d take it a little further and see how many outfits I could get with only 10 pieces of clothing. As when I have chosen my own capsules (to see all my capsule wardrobe blog posts, go here), I started with more and edited it down to 10 items. I made sure to have basic tops (white tee, striped tee, and dressy shell) and bottoms (dark wash jeans and black pants). I wanted to have a versatile dress and lots of top layers that would go with every foundational piece for lots of combinations. 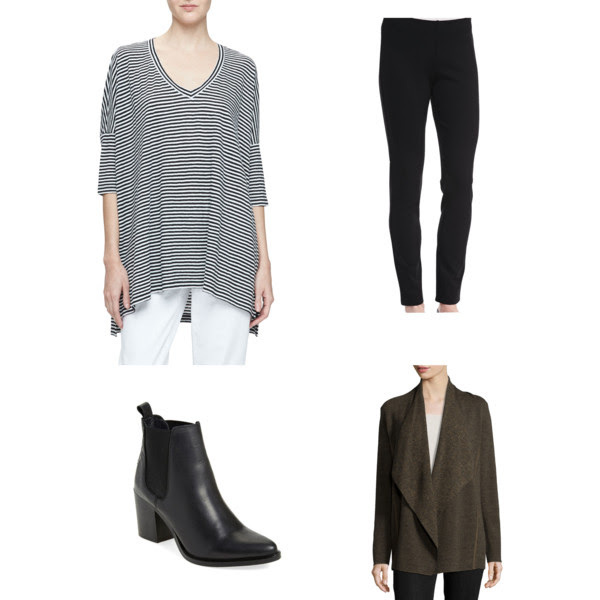 Here are the 10 Eileen Fisher pieces: Sleeveless Silk Long Shell, Dolman Sleeved Linen Tunic, Long Sleeve Jersey Top, Long Draped Open Cardigan, Fisher Project Wool Poncho Top, Fine Merino Birdseye Angle Front Jacket, Wool Blend Twill Graph Serape, Slim Ponte Pant, Washable Silk Dress, and Soft Stretch Skinny Jean. You may have noticed that the prices on these items are higher than some I might usually post. As I mentioned in a previous blog post, this is an amazing company. When you pay a higher price for an Eileen Fisher item, you're paying for the fact that these are classic pieces made with quality fabrics that won't be out of style in six months. You're paying for the fact that the items are made with textiles that are produced with less waste and fewer chemicals. You're paying for the fact that this company actually tracks the supply chain of what its products are made of to ensure that when they say it's organic cotton, it's actually organic cotton. You're paying for the fact that this company is committed to human rights and not only monitors its factories for violations but is beginning to do cell phone surveys of workers to allow them a voice. 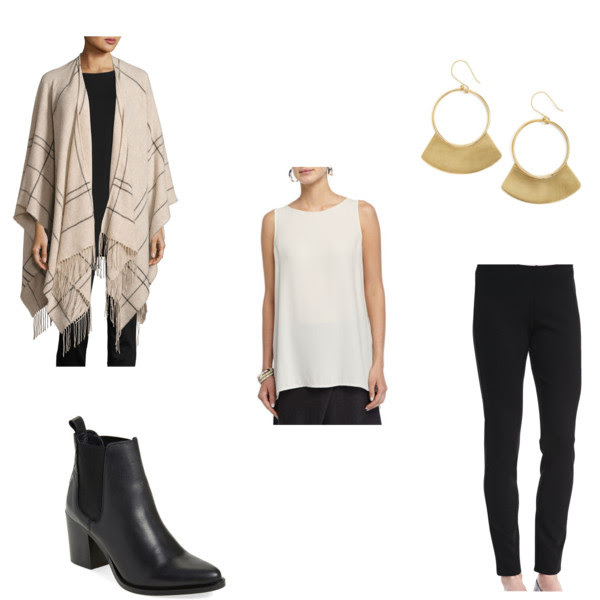 There are also many ways to get discounted Eileen Fisher pieces. I've found pieces on eBay, at consignment stores, Nordstrom Rack and on sale at the Eileen Fisher store. If you can shift your buying from 4 fast fashion pieces to 1 discounted ethically-made piece, you'll be doing good at the same time as you reduce your overwhelm from excess in your closet. But back to the outfits! 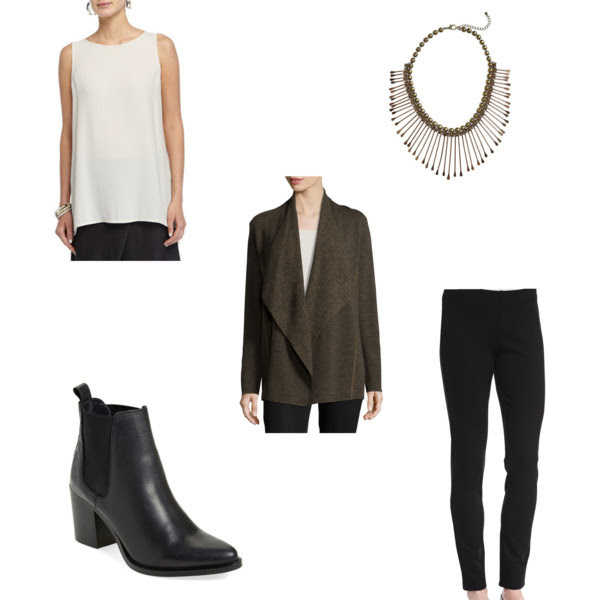 All in all, I came up with 24, a good month's worth of looks for both casual and dressy work and play occasions. To see a 10 piece capsule in person and get tips on how to style Eileen Fisher pieces, come to our special event at the Plaza Frontenac Eileen Fisher store THIS Saturday, December 17th from noon-3pm. We’ll have light refreshments and lots of good people and clothes. See you there! To hear more about mindful closet events and discounts, sign up with your email address to receive news and updates. As if anyone was in doubt… So, right about the time I put up that last blog post (about, ahem, not buying if it’s not on your list), I started feeling bored with all my black. Maybe I jinxed myself, maybe I was bored, maybe I should have-I don’t know-taken a nap instead. But I found myself between appointments killing time by stopping by Avalon. I saw this cool vintage sweater, and although I did give quite a bit of thought to the purchase, it was NOT on my list. But I bought it, and it was secondhand, and it was $18, and I really like it. Everything else I'm wearing were super mindful, wear-all-the-time purchases. It's not the end of the world. P.S. This tank I'm wearing from Eileen Fisher gets worn about twice a week. Pricy, but so worth it. 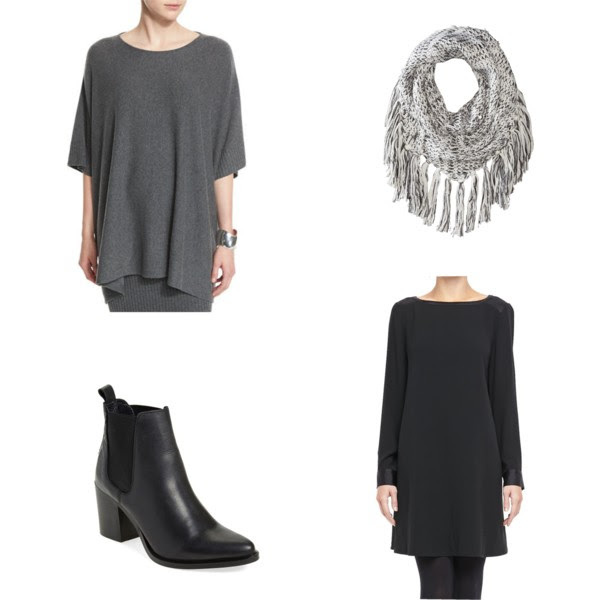 Check it out at the Plaza Frontenac Eileen Fisher store on December 17th from 12-3pm and get my take on how to style it. Sign up with your email address to receive mindful closet news and updates. Unlike in past jobs, now there's only one thing that keeps me up at night. And that's whether stores will have the items my clients need. I can find almost anything online, but when you need things within a few hours at one physical location, I always get anxious until I get in there and start finding pieces. I don't have control over what’s there. Almost always, my fears are unfounded and I find what we need. Except for last week, when I didn’t. Come on stores, where are the fun printed three-quarter sleeve poly blend blouses for my active chiropractor mom client? Sign up with your email address to get more shopping and wardrobe tips. As you know if you’ve read any of my other posts, I’m a simple outfit kind of gal. I like neutrals with a bit of interest. For me that interest usually comes in the form of a necklace or scarf. I’ll be honest, I get bored by my outfits sometimes. It’s usually at the point after I’ve gotten dressed, and I’m like “that’s it?” Then I remember scarves and I get happy again. Seriously, throw on a scarf with the most boring of outfits and all of a sudden, you’re cool. Ok, but how do you tie it? And even before that, how do you pick the right one to buy? When buying a scarf, look for a few things. You want to make sure that the texture of the fabric is soft and malleable. If it’s a pattern that you like, but the fabric is stiff, it’s always going to feel awkward when you wear it. Case in point: last year’s blanket scarf trend. I’m sorry, but I don’t want to feel like a turtle trying to peek out from my shell! On the other hand, if it’s too lightweight, like silk or chiffon, it won’t stay where you want it and will slip around. Also, the width and shape are important. 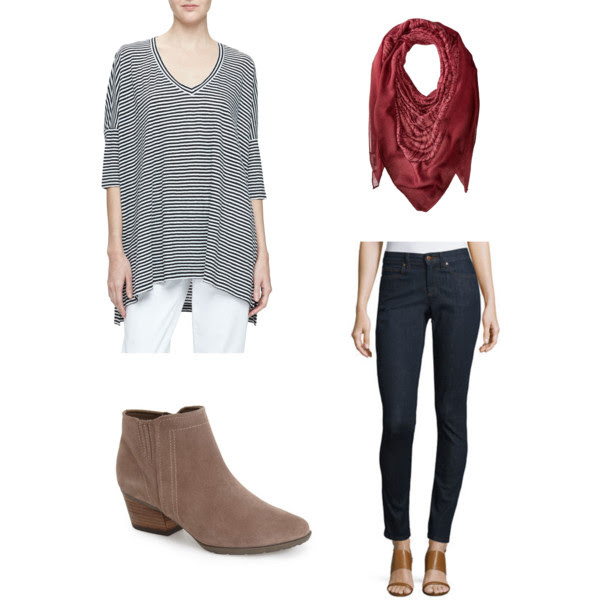 If it’s too narrow, you’ll get that early 2000s skinny scarf look. I like either a substantial rectangle (between 18-24 inches wide and 4-5 feet long) or a square. Here are two easy techniques to add to your scarf tying repertoire. 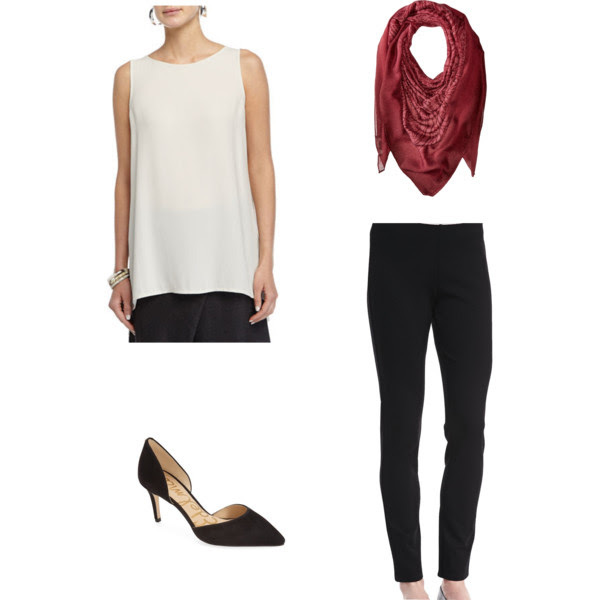 1) Hold a rectangular scarf by the narrow end with both hands, one on each corner. 2) Drop one corner. This is important. If you just take the scarf and loop it without adding this tapered edge, you’ll get a chunky, blocky end to your scarf. 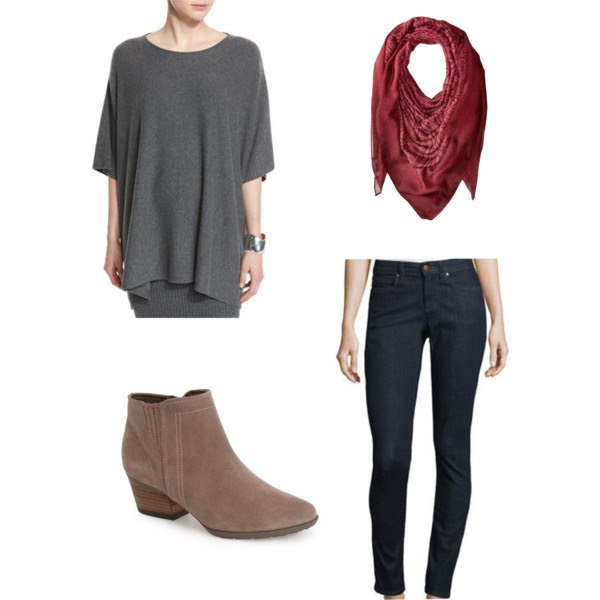 3) Use the hand that’s still holding a corner to pull the scarf around your neck and down in front. 4) Loop it back around the neck a second time. 5) Loosen the loop so it’s not snug against your neck. 2) Fold it in half diagonally, making a large triangle. 3) With the triangle pointing down, hold both ends and bring them up. 4) Pull the ends around your neck, swapping hands. 5) Pull ends back around to the front and tuck under the V that’s been created by the triangle of the scarf. Just for fun, I made a couple of quick videos to show you how easy it is! Last summer, this top bit the dust. It was a bummer, because I didn't feel like I'd worn it for as many years as I would like. Since a relaxed white top is a pretty important component of my summer uniform, I set out to search for a replacement. I tried all of these tops (above) and ended up with the cheapest version, simply because it fit best. The length wasn't too cropped, the sleeves hit in a good place and it also has the added benefit of being machine washable. I don't normally advocate buying multiples, but because this one hit so many of my criteria and because it's so integral to my wardrobe, I bought two. Yes, both in white. P.S. Keep your eyes out for a special event I'll be hosting at The Limited in August! I spent the month of December planning, organizing, and shopping for my next capsule wardrobe, but somehow never got around to blogging about it. Today, I'm at jury duty, which turns out to be the best place for me to get some work done! First and foremost, I really do like the concept and decided to continue it, adapting it to my needs. I learned a lot from the fall version and will try to avoid making the same mistakes. One mistake I made was having too many warm weather items. Once cool weather hit, I felt like I was wearing the same sweater constantly. Even I need a little variety, and yes, I did start to get a little bored with what I had. Also, a few of the items in my fall capsule only got worn once. Some of those made it to the donation pile. Some were for special occasions, and in the future, I don't think I'll include them in the capsule. 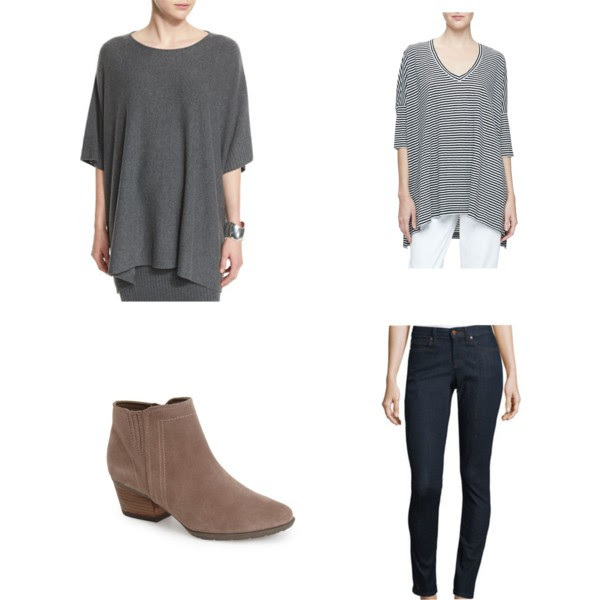 Since I didn't have enough cool weather items, I bought a few (this layering tee, this tunic, this sweater, these jeans) towards the end and started wearing them. It would have been ridiculous to wait until January 1 to get use out of them. I'm also not going to limit myself on accessories next time - I'll be wearing necklaces and scarves with abandon. Because I've focused and edited my wardrobe over time, many items got worn multiple times a week. Yes, clothes do wear out faster when you have fewer things you wear more often. I'm choosing to think of this as a positive (replacing things means I get to shop, which is my favorite activity), but it is a little frustrating when you invested so much time looking for those pieces only a few seasons ago. I knew many of these things were on their last legs, but it seems as if they've all given out at the same time. I ended up with quite a long shopping list of items to replace. One was a dressy black coat, and I "invested" (I don't think clothes are ever a real investment, but at least I could resell this easily if I wanted to) in a Rick Owens jacket from the online consignment store The Real Real (above, similar version here). I also got this Madewell purse as a Christmas gift from mr. mindful closet and I really love it - lightweight AND functional! I'll keep working on a post about my shopping list and the full winter capsule, but I'm not stressing too much about the fact that I didn't have it ready to go on January 1. It's all a process and I'd rather buy the right things at the right time than buy something mediocre in order to have it by an arbitrary date.